Have you ever used the site search function on a website, looked at the results, and immediately given up on finding what you were looking for? This has probably happened to you several times, if you think about it. Even some of the best sites on the Internet deliver completely inadequate, confusing, or downright… well… ugly search results to their users. Who wants to wade through six pages of results just to find one specific page or product? If your own website’s search is notorious for confusing visitors, not delivering specific results, or just isn’t living up to your expectations, it’s in your best interest to improve it. Keep reading to find out how to deliver better results to your visitors — and how to convert more site searches into purchases or leads. Why is site search so important? Even if your website only has a hundred or so pages — or less — your site search needs to do specific things to satisfy your visitors. If someone searches for “pricing,” you should be able to deliver your pricing plan page as the first result. If the query is specific to your industry, and all of the pages on your site pertain to it, searchers should be able to filter the results, or easily restructure their query to be more specific. Let’s go over a few ways that you can provide a better search experience to your visitors. If you choose to have a site search functionality, make sure your visitors can find it. Ideally, this means sticking it in the header, above or beside your navigation, or as a separate (large) element just below. 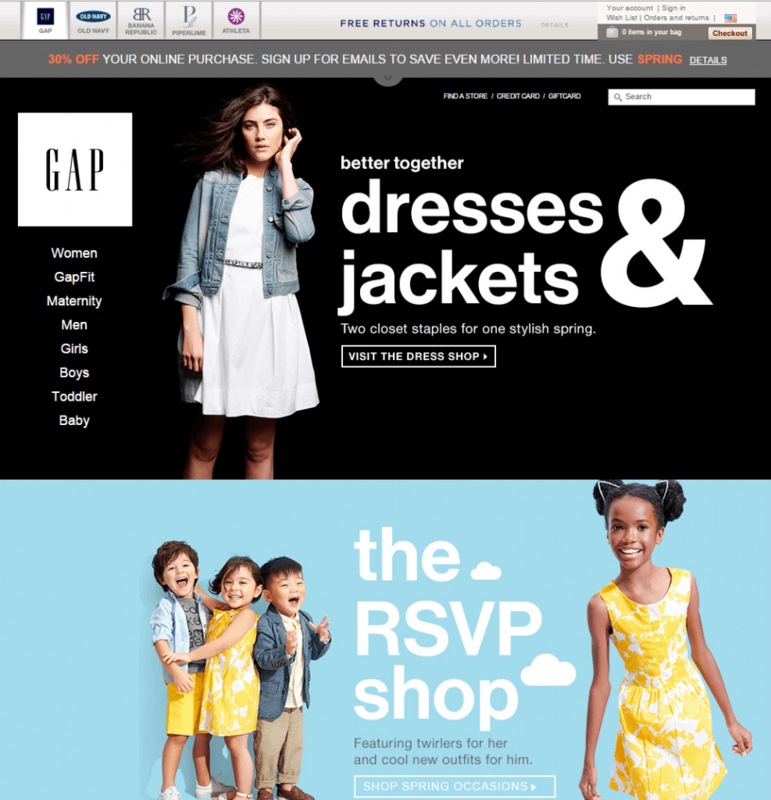 I’m going to pick on Gap a little bit: how long does it take you to find the search box on their current homepage? Your eyes may naturally shift to the top corners, but the combination of the multiple links, top menu, and high-contrast graphics makes the tiny white search box pretty difficult to find. Even worse: the first time I tried to click on the search bar, I clicked the black area and went to a landing page instead. The second time, I moused over the gray “30% off” box and it auto-expanded into a larger ad. When I moved my mouse back down to the new position of the bar, the box collapsed and my search bar was about 150 pixels higher than my cursor again. It was funny, but I couldn’t help but wonder how frustrated I would have been if I was seriously shopping for something. What if I don’t have site search? Hey, that’s your choice! Some sites just don’t need it, especially small ones. If you don’t offer search functionality, however, you should make every effort to compensate for it. This means creating knowledge bases, landing pages, resource lists, category pages, and so on. Your visitors may still want to try to find something really specific, and it’s your responsibility to guide them to it. 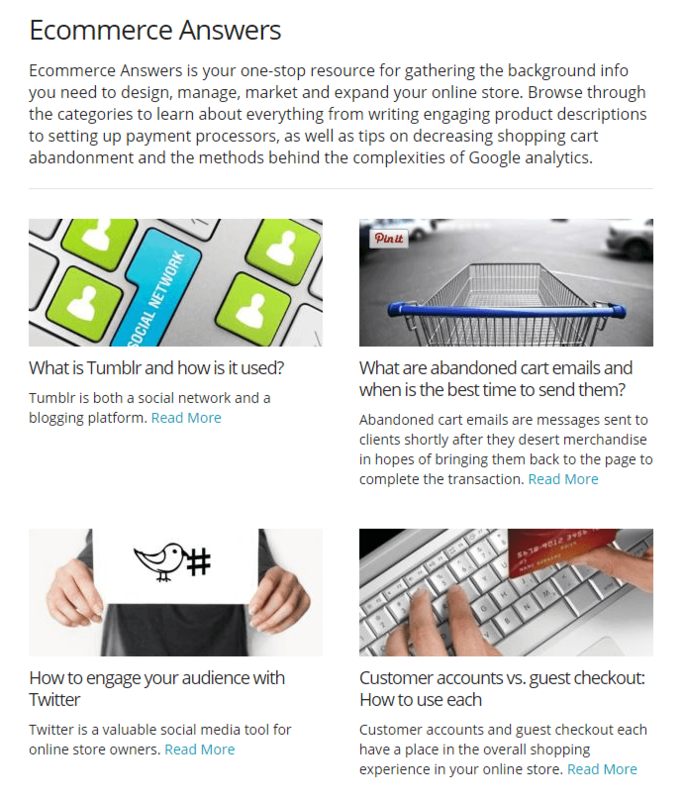 It’s a touch ironic that ecommerce software provider Bigcommerce doesn’t have site search, but they do have a pretty impressive resources section filled to the brim with guides, books, and articles, all sorted out in a user-friendly way. Having said that, if your knowledge base goes past 20 articles, it’s probably time to get search working, even if you’re dead-set on not having one. If I went to Bigcommerce looking for an answer to a question on payment gateways, I would have to spend a couple minutes navigating menus to get to the right spot. The Smashing Magazine study found that a large percentage of the retailers examined had implemented autocomplete for site searches. However, just finishing someone’s thought isn’t always helpful, nor does it always provide the level of filtering that large websites need. 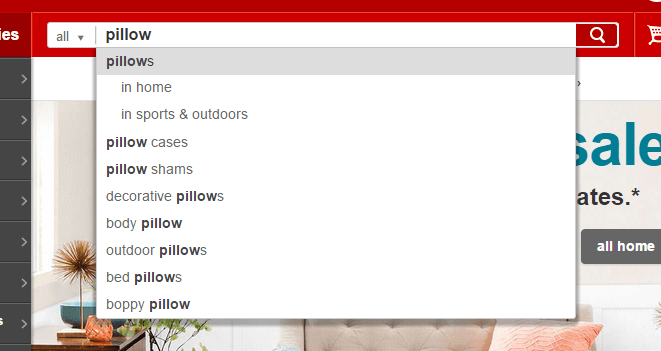 You’ll also notice that Target has two category options — “in home” and “in sports & outdoors” — which means that you can instantly say “yes, I’m actually looking for outdoor pillows for my deck!” and pick the right section from the get-go. This advanced in-search filtering is really only necessary if you run an ecommerce store with a product type that falls into two or more categories, but it’s a great touch. For example, if you run a clothing store, you may want to give those searching for “tank top” options like “in men’s clothes,” “in women’s clothes,” and so on. Faceted search, which Google does an incredible job explaining in more detail here, allows your visitors to immediately filter their search results based on criteria you define. So, for example, when you search Amazon for “hat,” the faceted search option is what allows you to pick from departments, shipping options, prices, and so on. 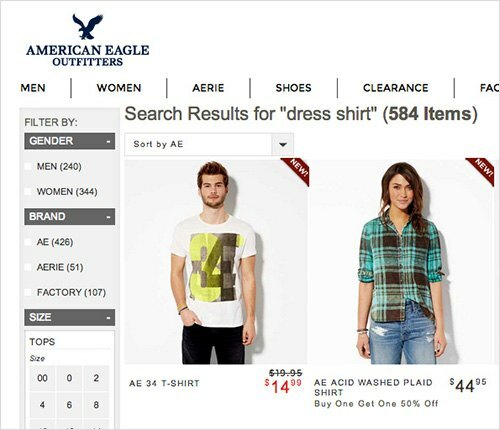 Ecommerce websites absolutely need faceted search (unless they only sell a handful of products). Visitors have come to expect it, and if your store is large, they simply aren’t going to have the patience to sit there and sort through page after page of results to find what they want. “Why don’t they just search for something more specific then?” you might ask. Well, sometimes your visitors don’t know what they want (what a shocker). 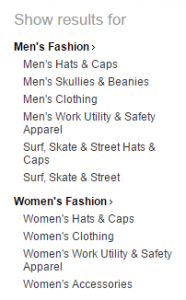 They might just want to search for “hat” and have you tell them “this is what we have.” They might not even realize that you carry hats for men as well as for women. Or they might be lazy! Faceted search is kind of like a waiter telling you a restaurant’s soups of the day. You have a vague idea of what you want, but you don’t know what your options are. You’d probably be pretty upset if a waiter said “why don’t you just ask me if we have broccoli and cheddar soup?” And you certainly could from the get-go, but you might not always think of it. Your visitors are the exact same way! Of course, there are some people who will come to your website and say “I know exactly what I want!” These are the ones searching by model number, part number, or product name. Allowing these data pieces to be used as search criteria can give you a huge boost with the audience of comparison or part shoppers. For example, try entering “DCF610S2” on the Ace Hardware website. 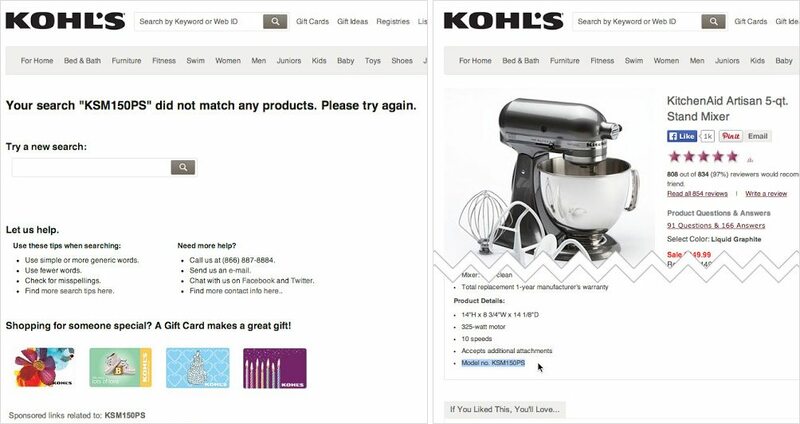 Rather than take you to a page of results with one item on it, the appropriate product page will pop right up! Now, your searchers might not always get these details right. Have you ever heard all the various pronunciations for the Greek “gyro”? Imagine someone who’s never seen that word spelled out trying to search for it online. They might look for “jyro,” or “geero,” “or “giro,” and so on. The same thing is going to apply for someone who has heard a product name in passing, and is trying to find it on your site. Check it out — they knew what I was looking for! 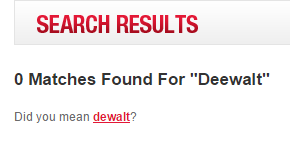 Clicking the “did you mean…?” link takes you to a page of Dewalt search results (which, I might add, are filterable from there). How can I make my site search better? After reading all these recommendations, you’re probably wondering how you should go about improving your site search. Depending on your site’s content management system (CMS), you probably have a couple options. Did you know you can enable Google search for your site? Yep! Google Custom Search allows you to add search functionality for your site powered by Google’s engine. Integration is free, and you can also make money from it (since ads will be shown with results by default). Google also allows you to upgrade your search package to remove ads, customize the design, and support much larger sites with more search queries. If you run a hosted ecommerce platform (like Bigcommerce), or use WordPress as your CMS, you can either tinker with your search settings or look for add-ons/plugins that will allow you to expand the functionality of your site search. You can also talk to your developer or agency about upgrading your site search to support the options you feel are most important, rather than using an “off-the-shelf” solution that may not give you all the options you want (or is really costly). Now that you’ve learned about the importance of site search, are you planning to upgrade or improve yours? Or do you have any questions about search that we can help with? Let us know in the comments below!